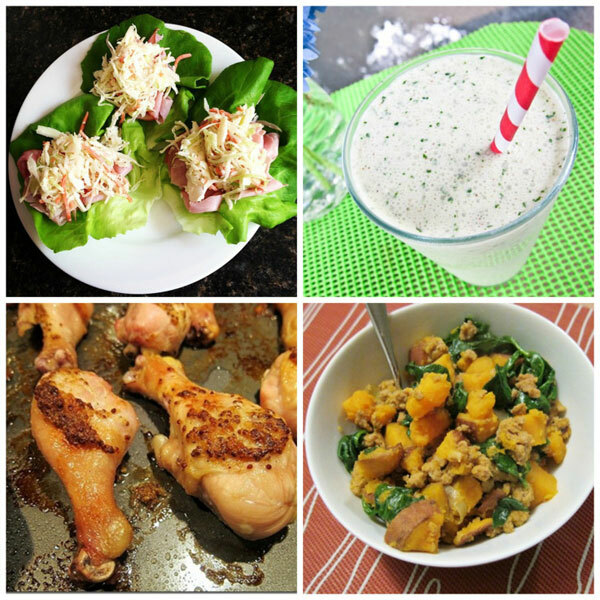 Are you new to the Paleo diet, but not sure what to eat? Or are you simply frustrated with hard-to-find ingredients or complicated recipes? Well, look no further! These throw-together meals require only a handful of ingredients and minimal effort, so you won't spend tons of time slaving away in the kitchen. Whether you're sticking to a Paleo way of living or just want to eat better, these four recipes are guaranteed to nourish your body, ward off hunger, and satisfy your taste buds. Now doesn't eating healthy sound good? Ham and coleslaw lettuce wraps. This meal comes together in a matter of minutes. Add a slice of organic deli ham to a large leaf of lettuce along with a scoop of coleslaw, wrap it up, and eat. It's as easy that! Coconut Almond Butter Smoothie. No one likes a whimpy smoothie, right? This one is loaded with all sorts of satisfying ingredients (as well as nutrient-dense chopped spinach), so it'll keep you full for hours! Skillet Sweet Potato, Ground Turkey, and Spinach Hash. To make this recipe, just combine the ingredients in a large saute pan, stir occasionally, and heat until the sweet potatoes are soft. It's the easiest recipe and makes great leftovers! Garlic Mustard Drumsticks. Just mix up the marinade and spread over chicken drumsticks before baking in the oven. So simple, so delicious!